PSA says it has no plan to raise capital. PARIS -- Shares in PSA/Peugeot-Citroen rose 3.3 percent today on stock market rumors that the French government could take a stake in the carmaker. PSA denied it has any plans for a capital increase. Speculation has been rife in recent weeks about the future of PSA, which has been hit hard by the economic slump. Reports have also suggested that PSA is in talks to form alliances with companies such as Fiat, BMW and Mitsubishi. During PSA's Feb. 11 presentation of its 2008 financial results, CEO Christian Streiff said the auto industry crisis will almost certainly lead to further consolidation among automakers, but he avoided questions on whether PSA would emerge from the crisis intact. Streiff refused to comment on whether he has discussed alliances with other automakers. The Peugeot family could block any merger with another European automaker because members would seek to protect the company's heritage and the family's preeminent role, industry sources say. The Peugeot family owns 30.27 percent of PSA shares and 44.87 percent of the company's voting rights. The family has jealously guarded its control over the automaker, which has been manufacturing Peugeot-branded cars since 1891. In January, Streiff rejected suggestions that PSA would give the French government a minority stake in the company in exchange for a financial bailout. The French government owns a 15 percent stake in Renault and is seen as a "deep pockets" minority shareholder that can guarantee the company's liquidity in times of crisis. Streiff and other PSA executives oppose limited state ownership because they fear that it would allow the government to influence key decisions. France announced Feb. 9 that it would offer PSA 3 billion euros in low-interest loans as part of a wider plan to help the country's troubled domestic auto industry. The French government also offered up to 1 billion euros in additional loans to PSA's captive finance arm, PSA Banque, to finance dealer floorplan investments and sales to customers. 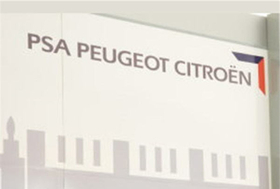 In exchange for the loans, PSA agreed that it would maintain employment levels in France and not close any of its five French factories. PSA's global new-car sales fell 4.9 percent to 3.26 million in 2008. Its operating margin dropped to 1 percent of sales and it reported a 343 million euro net loss linked to restructuring costs and the sales slump. Despite this worrisome data, Streiff said the group's low debt and continuing efforts to reduce costs should see it through the crisis. Today's spike in trading of PSA shares could be attributed to renewed interest in the automaker, sources told Automotive News Europe. Portfolio managers may be raising their PSA stakes as part of wider changes in automotive holdings, taking into account recent financial results and companies' strategic plans for confronting the global slowdown.